The knowledge of your face shape will help you to determine what hairstyle is good for you and what hairdo is not too ideal for you. Often time so many people do asked the question of how to know my face shape, what kind of face shape do I carry, and what is my face shape. In most beauty magazine, many adverts are being ran everyday on finding the best haircut that fit your face shape, there is no way you can know or find the perfect haircut for your face if you don’t first know your face shape. Here in this post, I’m going to let you learn how to know my face shape or how to know your face shape, whichever one you consider applicable to you. 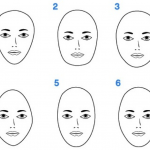 The six kinds of face shape above is the basic type of face shape, you may find some other shapes but they often fall into any of the six listed above. I will be taken the face shape one after the other from the list above to give you the simplest guides of how to know you face shape. But first question you need to answer here is; does your face shape wider than it is long? Find ruler to quickly do the measurement if you’re not sure about it. Round Face Shape: If your face is as long as it is wide, then you’re having a round face shape, though the measurement maybe slightly different but inasmuch it’s still close, it’s a round face shape. Heart Face Shape: Check out if your face is narrow at jaw line, wide at cheekbones and or forehead, if this is what you observed, then you have a heart face shape. 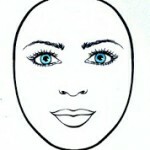 Oval Face Shape: An oval is typically 3 parts long to 2 parts wide. In other words, the width of your face is about 1/3 less than the length of your face. 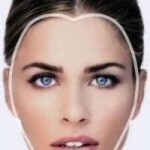 There are also no major corners on an oval face shape. 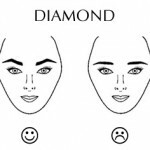 Diamond Face Shape: If after taken your measurement, you got widest cheekbones, narrow forehead and jaw line of nearly equal widths, know that you have a diamond face shape. Oblong Face Shape: If your face shape after taking the measurement is longer than its wide, then you’re having an oblong face shape. Rectangular Face shape: If your face is longer a lot than it is wide, then you’re carrying a rectangular face shape. Hope you’re able to know what face shape you carry, don’t get frustrated if it seems you don’t get it once, give it a try a again and follow the simple guide, you’ll surely get it.